When I visited 100% Design last September (2009) I met designer Chris Eckersley with his updated Windsor chairs for Sitting Firm. The generous seats are made from one piece of ash: such extra-wide boards are in fact unusual. To demonstrate, Chris had a huge tree trunk on display, sliced into sections, but with the bark still on. "That would make a nice bench," I remarked. And lo! 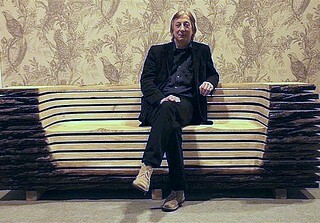 attending Birmingham Interiors this January (2010), Chris, together with Sitting Firm had made a bench and called it Barbara. Sitting Firm are "in that region of central England once known as Arden". It was on the Designer Block stand, amidst many other wonderfully original ideas.